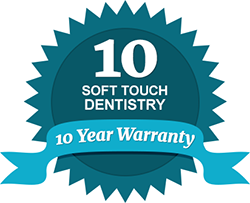 For high quality dental bridges, you can trust the caring professionals of Soft Touch Dentistry. We are a comprehensive family dental practice consisting of a qualified, highly skilled dentist, Dr. Sarah Thompson, and a dedicated team of dental support staff. Bridges are a dental procedure that addresses badly decayed or missing teeth. It is used to span the space where one or more teeth are missing and is cemented on to the natural teeth or implants surrounding the empty space. Dr. Thompson uses bridges that are made of top quality material to ensure you get the functional and aesthetic benefit you are looking for. By choosing an experienced cosmetic dentist to perform your bridge, you gain significant advantages. Dr. Thompson carries the precision and artistry to carefully design your cosmetic bridge to match your natural teeth color, size and shape. Our practice is equipped with the latest technology and advances in both restorative and cosmetic dentistry so that we can deliver excellent, long-lasting results to our patients. We offer a full range of cosmetic dental services to complete your new smile, including crowns, dental bonding, veneers and teeth whitening as well as clear orthodontic services. At Soft Touch Dentistry, we have the unique ability to offer a full range of sedation dentistry options to keep you as comfortable as possible during your restorative and/or cosmetic procedures with us. We offer oral sedation as well as IV sedation; Dr. Thompson is among a group of elite U.S. dentists that are licensed to perform IV sedation for patients who need it. You can trust that Soft Touch Dentistry is a place that makes you feel at ease from the moment you walk in our doors. We want your dental experience, whether it is to restore or enhance your smile, to be as pleasant and comfortable as possible. For the functional, healthy and attractive smile you deserve, turn to Soft Touch Dentistry. Contact our office today to schedule an appointment for your dental bridge. We welcome patients of all ages and accept most dental insurance companies. Our practice also offers flexible financing plans to help you get the dental care you need and desire.